^ a b "U.S., other powers kick Russia out of G8". CNN.com. 24 March 2014. Retrieved 2014-03-25. ^ a b "Amb. Wolfgang Ischinger Urges Inclusion of Russia in G8 | EastWest Institute". www.ewi.info. Retrieved 2017-03-02. ^ Until recently, the EU had the privileges and obligations of a membership that did not host or chair summits. It was represented by the Commission and Council presidents. "EU and the G8". European Commission. Archived from the original on 26 February 2007. Retrieved 2007-09-25. ^ "Officials: G-20 to supplant G-8 as international economic council". CNN. 25 September 2009. Retrieved 2009-09-25. 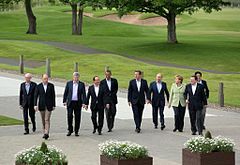 ^ "G20 to replace the G8". SBS. 26 September 2009. Archived from the original on 27 September 2009. Retrieved 2009-09-26. ^ "L'Aquila Food Security Initiative | TRACKING SUPPORT FOR THE MDGS". iif.un.org. Retrieved 2019-02-06. ^ "G5 Overview; Evolución del Grupo de los Cinco". Groupoffive.org. Archived from the original on 2009-07-10. Retrieved 2010-06-27. ^ Bremmer, Ian (14 May 2012). "Welcome to the New World Disorder". Foreign Policy. Retrieved 2012-05-16. ^ Bosco, David (16 May 2012). "Three cheers for homogeneity". Foreign Policy. Retrieved 2012-05-16. ^ Horgan, Colin (21 November 2012). "The G8 still matters: David Cameron". Ipolitics.ca. Retrieved 2014-03-25. ^ Dobson, Hugo (2011). 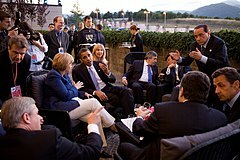 "The G8, the G20, and Civil Society". In avona, Paolo; Kirton, John J.; Oldani, Chiara. Global Financial Crisis: Global Impact and Solutions. Ashgate. pp. 247, 251. ISBN 140940272X. This page was last edited on 12 April 2019, at 10:05 (UTC).